It’s time to look at coins, because looking at coins can be very profitable. I’m not talking about looking into gold bullion coins—although they can be profitable, and I’ll explore them in an upcoming post. For now, when I say it’s time to look at coins, I mean it literally—it’s time to learn how you can actually look at a collectible coin so that all of its physical characteristics can be easily identified and assessed: nicks, scratches, and abrasions…wear and friction damage…alterations and doctoring…luster and originality. If you know what these things are and how to assess them, you’ll be a leg up on a lot of coin collectors who could behold the exact same coin and yet see far, far less. You can look at a coin as a work of art to admire its cultural significance and history. You can look at a coin to evaluate its positive characteristics, such as how free from flaws it is. You can look at a coin to identify its shortcomings, such as whether it displays a deceptive alteration. When looking at a coin for purchase or evaluation, it’s best to focus on its strengths and weaknesses so that you understand exactly what you are buying or selling. Save your appreciation of the coin’s history for another time. In my book The Coin Collector’s Survival Manual, Revised Seventh Edition, I liken looking at a coin to proofreading a letter. If you just quickly look over the letter, you might not find any mistakes. But if you carefully read the letter one word at a time, you stand a better chance of uncovering an error. In looking at a coin, a quick viewing might not reveal any imperfections. And overlooking even one tiny imperfection on a rare and valuable coin can be very costly! There are a number of physical ways of looking at a coin when you are trying to sum up its strengths and weaknesses. Some people hold the coin upside-down so that the design doesn’t distract them from uncovering flaws. In any case, you need to train yourself to look at the coin in its entirety—front (obverse), back (reverse) and side (edge). My most important secret is the concept of “first impression and overall impression.” If I look at a coin and at first glance it appears ugly, it probably is. Conversely, if at first glance the coin appears sensational, then I will evaluate it further and discount it for its shortcomings. More often than not, it’s the quick glance first impression that carries the day. Believe it or not, the number one mistake of beginning collectors is looking too carefully at coins to evaluate the grades of those specimens. Many top professionals with good close-up vision don’t use a magnifying glass to look at coins, at least not initially. I recommend a five-power glass—a relatively low magnification factor—so that you can see an enlarged view of the whole coin for an overall impression. If you are inspecting for altered surfaces, counterfeit characteristics, hidden flaws or unusual varieties (such as mint-made variations or mistakes that can add value), a higher power glass is in order. To systematize coin viewing, it can be helpful to imagine a coin as a clock. First, patiently look at the coin’s obverse, carefully scanning it clockwise. Next, look at the reverse, and scan it in the same clockwise direction. Left-handed people are sometimes more comfortable looking at coins using a counter-clockwise scan—that’s fine of course. If the coin is not in a grading service holder, carefully inspect the edge. The two most important places to inspect on a coin are its grade-sensitive areas and its high points. A grade-sensitive area is the part of a coin, usually a prominent human face on the obverse, that would detract considerably if it exhibited an obvious scratch or flaw. If the same-size scratch were visible on the reverse more-hidden in the design, it would not be as significant—or grade-detracting. The high points are extremely important, because these are the areas that exhibit the first signs of wear. Light friction or evidence of circulation on a coin’s highest points is what separates a Mint State coin from its circulated counterpart. The difference in value between a Mint State coin and one which has the slightest trace of friction on the high points can represent a high percentage of the potential value, meaning, in many cases, many thousands of dollars. Practice makes perfect, and refining your ability to look at coins is a classic example of a skill developed from learning by doing. A good way to learn is by looking at lots of coins. 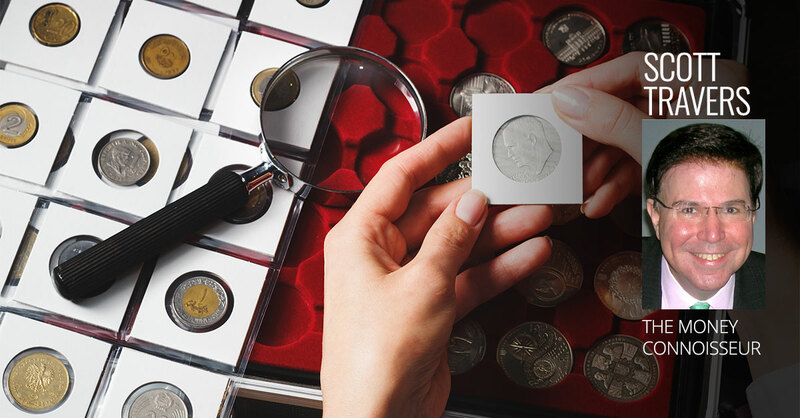 Visit coin conventions where coins are certified by grading services, and grade one coin at a time yourself. Look at the certified grade only after you have examined the coin. Practice may make perfect, but in this case, practice will help you to identify any coin that is less than perfect—and just how far from perfect it is.